Would you love to find a simple, budget-friendly craft project that people of all ages will enjoy? You have definitely come to the right place. 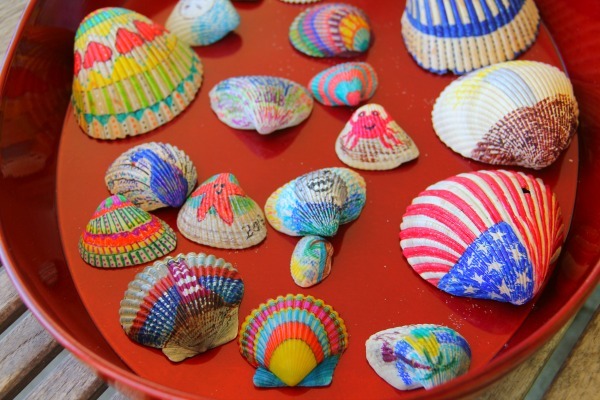 Check out the simple steps to make these easy, inexpensive DIY Seashell Decorations. 1. First, gather up white or light colored shells that you have either collected at the beach (Yeah, FREE!) or purchased in bulk. If straight from the shore, make sure that the shells are rinsed thoroughly and dried. Hobby Lobby and Michael’s are also good choices because you can use their frequent coupons and sales to help reduce the purchase price. Also, you may wish to consider Etsy. work very well for shell decorating. The markers vibrant colors really stand out. The fine tips glide over smooth surfaces and are up to the challenge of ridges and contours that are present on many shells.
. Add in some paint brushes, especially fine tipped, and you are in business. in both matte and gloss. Now in case you are thinking, hey wait a minute Sarah, I thought you said that these are inexpensive shell decorations! Why am I having to buy or use from my craft stash several different items? The beauty of this craft project is that your supplies can be used over and over again for multiple types of craft projects. And the price per shell decoration of art supplies used is really low. Once, you have your supplies, all you have to do is get to creating. The possibilities are endless and your skill and age level do not matter. The shells will all end of beautiful in their own way because they are your unique creations. Here are some examples that I and some of my friends (Karen, Linda, Bobby, and Pam) created. Once, you are done decorating your seashells, simply spray acrylic sealant on them and let it dry. Repeat. With a couple of coats applied , the shells will be good to go for displaying or giving as gifts. Give them to family and friends or leave them at a park, doctor’s office waiting room, etc.. for strangers to find and enjoy. These are all so cool. Love the idea of sea shells as an alternative to rocks for the summer! This is a Featured pick for the new Merry Monday party going on now. Can’t wait to see what you are up to next. Thank you so much! Hope that you have a great summer.